Dost: "This is just the beginning"
Düsseldorf - Prior to VfL Wolfsburg's 4-1 demolition of Fortuna Düsseldorf on Saturday, the Auto City club were bottom of the league with the worst attack in the top-flight, having mustered a paltry two goals all term. Yet in the aftermath of Felix Magath's departure, caretaker coach Lorenz-Günther Köstner seems to have breathed fresh life into the side, leading them to their first win since the opening day of the season. The victory also stemmed a run of four consecutive defeats in which they failed to hit the back of the net once, whilst conceding ten. Key to the renewed success was Dutch striker Bas Dost, who scored for the first time since that Matchday 1 triumph over VfB Stuttgart. After the game, the 23-year-old spoke to bundesliga.com about his relief at getting back to winning ways, as well as seeing his name on the scoresheet once again. 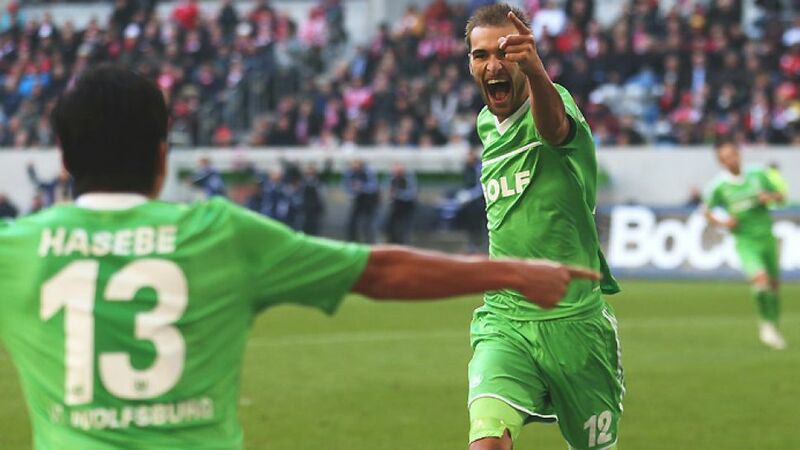 bundesliga.com: Bas Dost, congratulations on the 4-1 win and your two goals. How much good does this do you after a few difficult weeks? Dost: It was great to win. We hadn’t scored for a long time and as soon as we made it 1-0 we started playing very well, so we're happy. bundesliga.com: You scored on the opening day of the season, then you didn't find the back of the net again until this game. What made the difference this time? Dost: I scored lots of goals last year in Holland and I only managed one here in Germany in the first eight games. That’s not a lot. It was great for me to score again. bundesliga.com: How was the last week, with the change of coach? Dost: It wasn’t good. Felix Magath is the man who brought me here and he made me fitter, but things were not working with the whole team. That led to the change in coach and we just have to move on. bundesliga.com: Are you sorry he’s gone? Dost: It wasn’t nice what happened, but that's football. A new coach arrives and we win 4-1 - it’s incredible. bundesliga.com: What did interim coach Lorenz-Günther Köstner do in the few days he had? Dost: He spoke to all the players. It was enjoyable. We needed to do something after going seven games without a win. The players also spoke a lot with each other this week and the captain [Diego Benaglio] had plenty to say. bundesliga.com: Was the win over Düsseldorf a new beginning in a way for Wolfsburg? Dost: I think we can be happy with this victory, but this is just the start. We now have to carry on and build on this. We only have eight points and that's far too little. Dost: Diego's a great player. He showed what he's capable of. For me as a striker, it's great to have him in the team because he feeds me with chances. bundesliga.com: Before the season started, Wolfsburg’s goal was to qualify for Europe. Do you still think that’s a realistic aim? Dost: Yes, I think so. We just have to wait and see how the next few games go first.